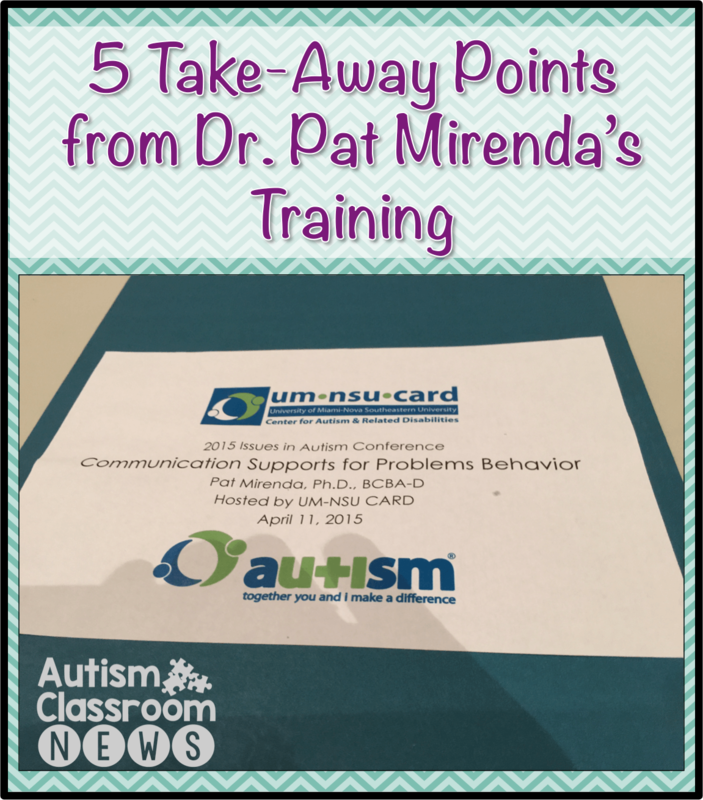 These 5 take-away points about communication and challenging behavior come from a training provided by Dr. Pat Mirenda. Dr. Mirenda’s work was some of the earliest my mentor pointed me to when I was in graduate school and it continues to have a big influence on my work. She has an impressive ability to make everything complicated much clearer and to present things in a common sense way with clear applications. You may be detecting a wee bit of idol worship here and she definitely should be on my list of Autism Presenters worth seeing. I want to thank the University of Miami and Nova Southeastern University CARD center for bringing Dr. Mirenda in to speak. I got to hear her speak for a full day and several commenters had asked for some more information about some of the quotes I shared in social media. So I thought I would take this opportunity to share 5 Take-Away Messages from Dr. Mirenda’s talk with you. If you have read this blog before you know how strongly I feel about this one. 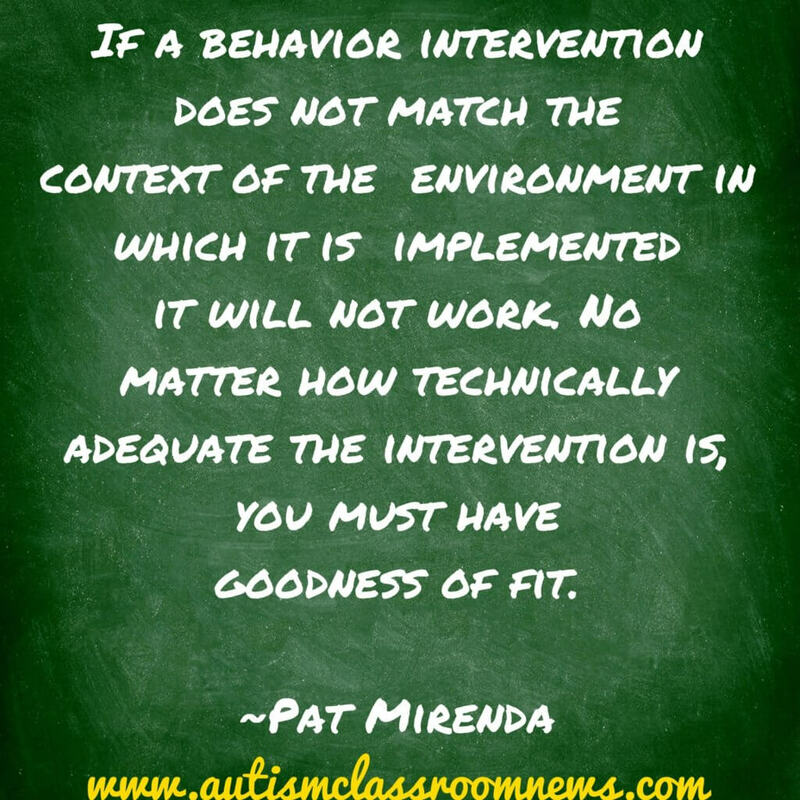 Dr. Mirenda’s statement was (and I paraphrase), if you aren’t using visuals with individuals on the spectrum, you are missing a big piece of the effective interventions. She talked about using Between Activity Schedules and Within Activity Schedules. These are what I often call daily schedules and mini-schedules. 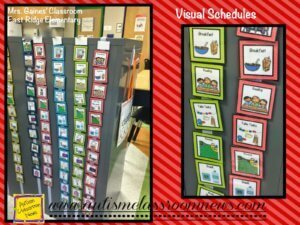 For resources and more information about visual schedules check out THIS POST. There were a couple of new nuggets of information that I took away from the discussion of the use of visuals. The first was that we don’t ever take visuals away from students until they remove them themselves. This isn’t new–I’ve pleaded with people to do this for years. However, she had a good analogy (and I love a good analogy) that might help to get that point across for all of us who have struggled to make people understand. I wear glasses. With my glasses on, I can see everything perfectly. Since I see everything perfectly, should I stop using my glasses? Of course not…then everything would be fuzzy. Until I get Lasix surgery, I need to wear the glasses. Just like until a student learns to monitor the daily activity or routine, he still needs the schedule. The second point she made was the importance of teaching students to use the visual supports. Again this is nothing new and I talk about how to do that HERE. Once again, though, here’s a good analogy to use to help others understand. You don’t hand a basketball to a child and expect him to play pro ball (or even Duke Basketball!–see what I did there?). Along the same line, you don’t hand a schedule to an individual and expect her to use it independently. You have to TEACH it. 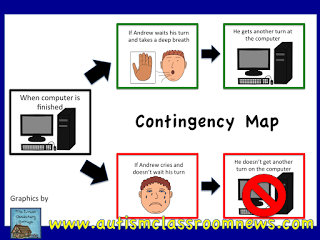 You can read more about contingency maps and download a freebie to make your own HERE. Contingency maps are a way of visually presenting information about the natural contingencies of the appropriate behavior and the problem behavior. 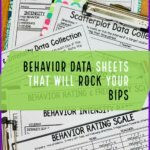 Make sure to relate them to the function determined from the functional behavior assessment. 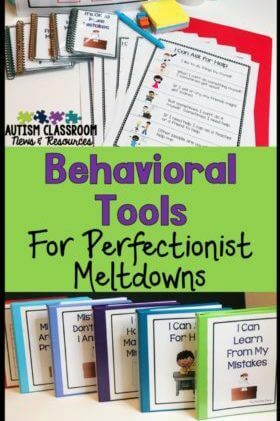 FCT (teaching communication responses that serves the same function as the challenging behavior) was found in a meta-analysis to be the most effective method for using augmentative communication to address challenging behaviors (Walker & Snell, 2013). It was more effective than the Picture Exchange Communication System (PECS) alone and all the interventions that were based on an FBA were more effective than those that were not. And yes, you have heard the importance of that before. She also shared some research and ideas for using voice output communication books or apps (either recordable picture albums or apps) to create stories with pictures. For individuals whose behavior functions to gain attention from peers, these books are a way of structuring the conversation between them. They can share the book and tell the story by taking turns hitting the voice output button that tells about that page. 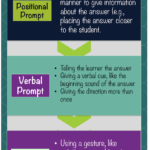 It’s a more informal way of teaching conversation and supporting social interaction and it can take the need for prompting out of the interaction to make it more authentic. I will add this to my list of posts to write about the future, especially since I have a few kiddos I can think of that would benefit from it, but until then, you can read more about the research behind it HERE. This is another one I know I preach, but it’s an important lesson for all of us to remember. It is particularly important to remember if you aren’t a big part of the context in which the intervention will be implemented. For instance, I’m a consultant…it’s my responsibility to make sure that I tailor the intervention and train the staff to implement the plan. If they don’t implement the plan, I have to ask myself first what I could have done differently to make it more successful. I have to ask whether the plan we developed really fits into the environment. For instance, did I recommend an intervention in a classroom that required significant attention from the teacher all day long? That’s probably not going to be successful unless it is very temporary and the teacher has help. I need to find an intervention that doesn’t monopolize the teacher’s attention but still meets the needs of the student. You can read more about the importance of this and ideas HERE. I love this one. How many times have I (or you) said to a parent or a teacher, “Pick your battles.” We say this because when dealing with challenging behavior we can’t do it all at once. Like most things in life, human behavior is not black and white. Sometimes, you will be most successful if you give a little to get a little. A good example is when we teach a student to request a break. First we have to let him have control of the situation by using his communication…that’s the short-term compromise. At first he gets out of what he wants. 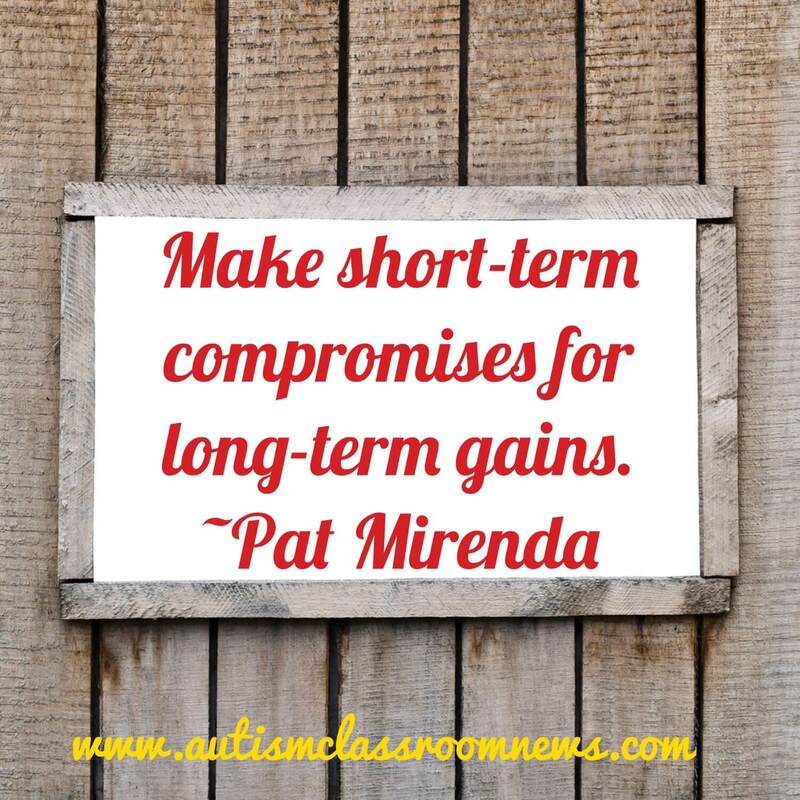 Then once he can do that, we start asking him to do a little more before he gets the break–and in the long-term we have a student who can ask for a break but wait for it to take place and behavior improves. That’s the long-term gain. So, I will be back in my next post with an exciting freebie for discrete trials. 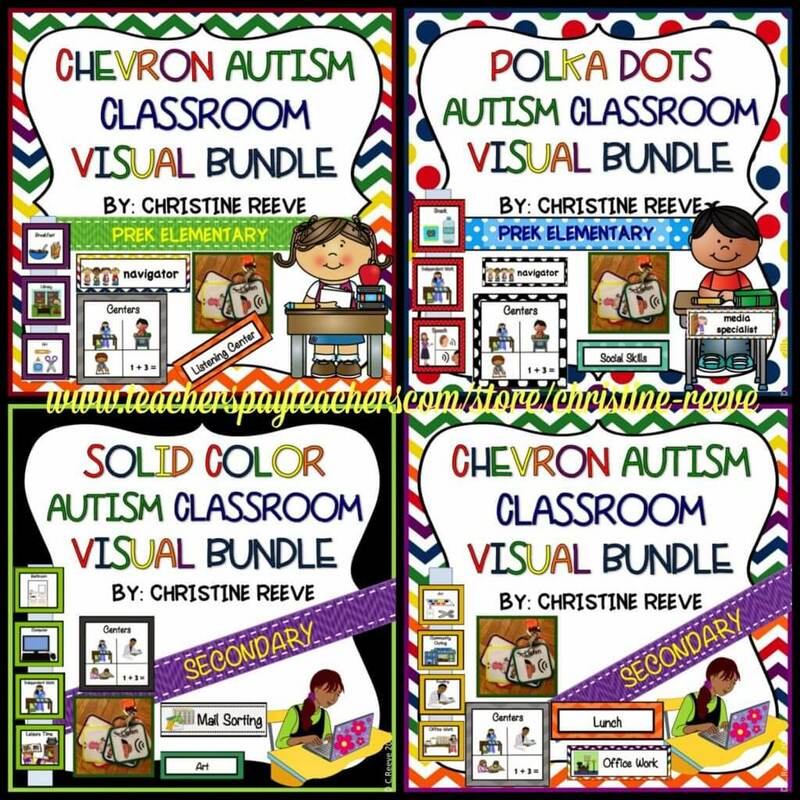 Also, if you haven’t noticed, my TPT Store has been renamed–It is now the Autism Classroom News-Christine Reeve store–to make it easier for blog followers to find. All the links seem to work as they are supposed to, but if you find something that doesn’t please let me know. 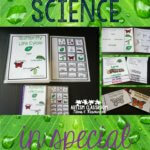 Looking for visual supports to help with behavior, check out these visual supports in my TPT store. I haven’t been fortunate enough to hear Dr. Mirenda speak, so I appreciate this summary! I really love the visual contingency plan- so clear! I believe so strongly in using visuals! Thanks Linda! I love to hear Dr. Mirenda speak and the visual contingency maps are just such a wonderful way to make the consequences of all actions much clearer. Thanks for reading!